Couponing with Martha: Dash 4 Cash and Prizes TONIGHT! 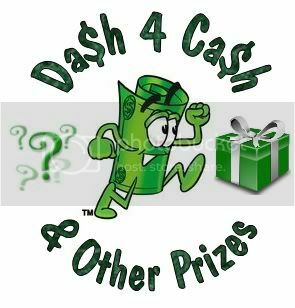 Dash 4 Cash and Prizes TONIGHT! Do you wanna have fun tonight? And I mean A TON of fun...Not only have fun but WIN prizes too!!! Of course you do! Who doesn't like to have FUN and WIN?? We have teamed up with and AWESOME group of bloggers to bring you FUN and PRIZES!!! Each blog will have their own prize to giveaway!!! We made it even better by making is SUPER Easy to enter! Wanna Have fun and Win Prizes? Here's how! Don't forget you only have 1 hour to like all the blogs and enter! That is it! Isn't is sooo easy? And you only need to do it one time total, no need to go to every blog's facebook page to enter, entering on ANY facebook page gets you entered! Look for the announcement post for the winners no later then Friday!! Don't forget to come to the facebook page at 9PM EST to join in on the fun!!! See you there!